Before I closed the bike shop permanently, I took home a Lezyne ABS-2 Floor Pump. 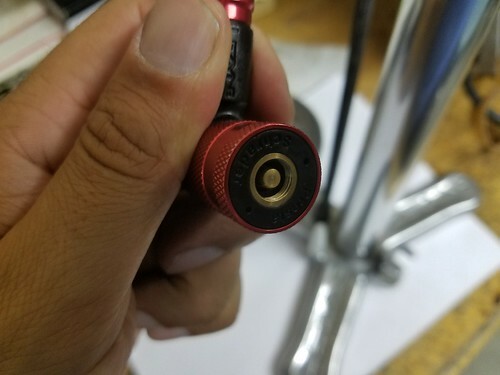 At the time, this was a pump that retailed for over $100 and featured a fancy chuck (the part that fits on the valve of the inner tube) that allowed relatively quick attachment to Presta valves while also allowing inflation on the other valve types (Schrader and Dunlop being those other types). The pump, unfortunately, had a design flaw. To remove the chuck from a Schrader valve you have to turn a collar on the chuck to the left (lefty-loosey). This had the tendency to unscrew a fixing bolt at the back of the chuck. A small spring would shoot out, and you’d be left with a chuck head attached to the valve and the other half sort of bobbing around in the air. Loads of people had this happen, and went online to ask for help. No doubt this design flaw, on such an expensive floor pump, generated a fair share of confusion and frustration. I felt both of those emotions. Buy nice or buy twice, right? Well, I bought nice, but it turns out it was not so nice after all! Lezyne did away with the ABS-2 chuck, and offers no replacement parts – but will replace your chuck with an alternate design, with proof of purchase. You have to email them at support@lezyne.com and mention the pump type. They will reply with a request for your proof of purchase and ship an alternative pump chuck your way. When my pump exploded, for the third time, I lost the small inner spring in the chuck. I did a thorough sweep for it in my garage but, alas, came up empty. The good news is that the underside of all my tool cabinets and shelves are cleaner than they’ve ever been. I was lucky enough to have two of this exact model of pump in my garage. I disassembled the good pump and measured the small spring that had gone missing. The spring has closed ends but is not ground. There are 14 active coils and two inactive coils on each end. The mandrel size recommended for this spring is 2.97 mm or .117 in (I used some 1/8″ rod stock, which is close enough). I calculated the mandrel size using some DOS software (MANDREL from Marv Klotz’s website: https://myvirtualnetwork.com/mklotz/ ) I ran in a DOS emulator (DOSbox) on an old iMac. If you Google search for “precision steel wire .007 in” (or some combination thereof), as I did, you’ll come across large $45 and $60 spools of the stuff. I was able to find 10 pieces of 1m long wire for about $17 total (including shipping). When the wire arrived, I marched over to my bench vise and clamped a low-end variable rate electrical drill upside down into the vise. I stuck some 1/8″ rod stock in the drill and slid one end of the .007 in steel wire at 90 degrees to the rod stock. I marked 35mm on the stock with a grease pencil and set the drill for the slowest rotational speed. Holding the wire in one hand, I looped it around once by hand to set up my first inactive coil. Then I pulled the trigger on the drill and slowly let the wire feed around the 1/8″ stock until the wire got to the 35mm mark. I stopped the drill and looped the wire around once by hand for my last inactive coil. My result was a wonky little DIY spring of approximately the right dimensions and specifications as the original. I installed my spring in the pump that was missing a spring and … it worked! I went around the garage and inflated some tires just to be sure. 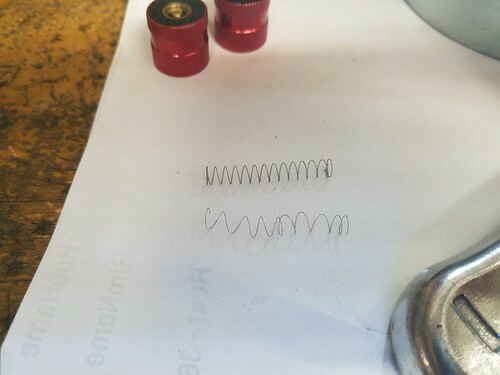 So, if your Lezyne ABS-2 pump chuck has burst open, and you’ve lost that little spring on the inside, you can make your own for half the cost of buying a new pump chuck. I considered, for about 30 seconds, going into business as a Lezyne ABS-2 pump chuck spring replacement guru. Fortunately, I snapped back to reality. How many of these lousy springs would the market demand? Not enough to justify my time, setting up the product online, and ensuring that what I made was worthy of being sold (which would entail something better than hand-feeding wire on an inverted power drill to produce a wonky little spring). If anyone out there in internet-land has a lathe and the machine shop experience, perhaps you can make these and sell them to desperate Lezyne ABS-2 floor pump owners. Heck, maybe someone at Lezyne can make a few and sell them on their web-site? It would be the decent thing to do, guys.